BEST NON-SLIP and SKIDLESS HOT YOGA TOWEL: This 24" x 72" skidless anti-slip towel is the perfect size for your yoga and Pilates mat. The Sanskara Yoga towel is non-skid, slip free, sweat absorbing and light. It grips even more when damp, especially useful for hot yoga -- great for Bikram and Ashtanga yoga. SOFT, ULTRA ABSORBENT, QUICK DRY and MACHINE WASHABLE: Our sweat activated, premium microfiber materials (80% polyester, 20% nylon) are designed to soak up excess sweat as you practice. It's machine washable and easy to take care of -- just throw it in the washing machine with your other clothes and then air or tumble dry. 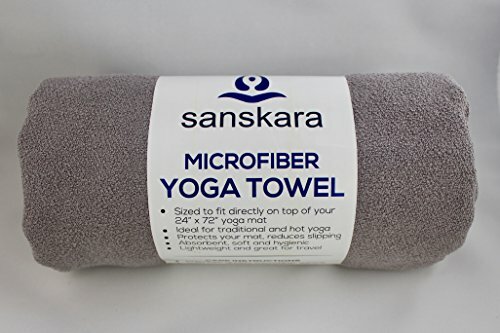 EXTRA LONG DESIGN is the PERFECT SIZE: This 24" x 72" hot yoga towel is the perfect size for almost any yoga mat. Use it to cover standard studio mats and other popular yoga mats such as Gaiam, Lululemon, Jade, Sivan, Shandali, Fit Sprit, Reehut, Manduka, Aurorae, Kulae, Orla Kiely, Bean, Timbuk2 and Hugger Mugger mats. Add life to your yoga mat with this extra layer of protection. 100% SATISFACTION GUARANTEE and MAKES A GREAT GIFT: We love our products and know you will too, so we provide a 100% money back satisfaction guarantee. We are certified yoga instructors and a family owned business, so we stand behind our products and reputation. Friends and loved ones will think of you each time they use this great towel, at the yoga studio, gym, golf course, hotel, camping or at the beach. It makes a great gift for all ages and lasts for years. HYGIENIC, CONVENIENT and TRAVEL FRIENDLY: Shield yourself against harmful bacteria of shared studio mats and extend the life of your own mat. Enjoy feeling fresh and clean when you exercise with this hygienic, microfiber, non-slip, absorbent towel. Take it to yoga class and place it over a studio mat, saving yourself the hassle of carrying your bulky yoga mat. It's lightweight, personal, and fits nicely into your bag. When traveling, toss this in your carry-on and enjoy practicing in your hotel. If you have any questions about this product by Sanskara, contact us by completing and submitting the form below. If you are looking for a specif part number, please include it with your message.